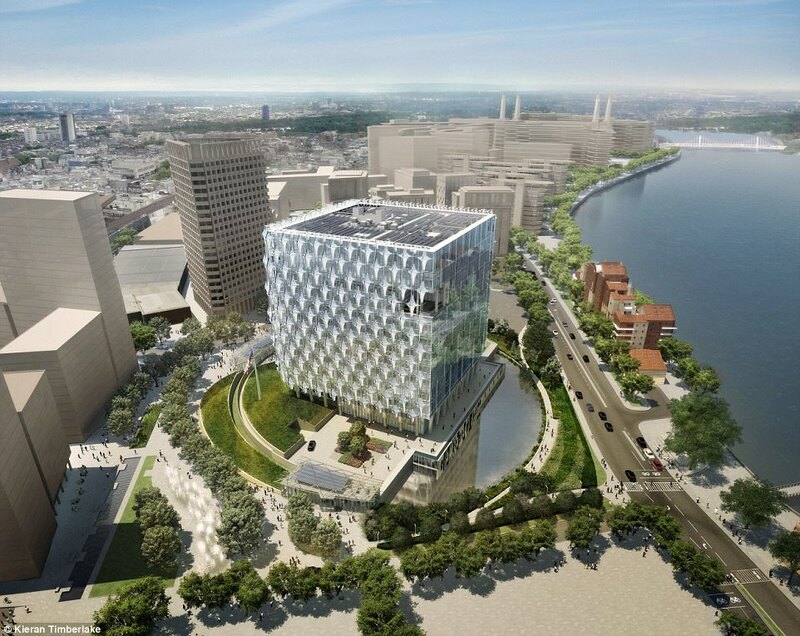 LONDON: At $1 billion it is the most expensive embassy ever constructed. But its designers say the new American chancery on the Thames River marks a paradigm shift in design: the U.S. Embassy here will exude openness, while hiding all the clever ways it defends itself from attack. After decades of building American embassies that look brutalist or bland, like obvious fortresses, the soon-to-be opened chancery in London is a crystalline cube, plopped down in the middle of a public park, without visible walls. The building does not shout, "spies work here!" or "stand back!" even though this city has been subjected to a string of terror attacks. Instead the vibe is modernist museum, that also happens to issue visas and might have a few hidden bunkers somewhere we are not saying. Instead of blast walls, there is a perimeter pond, with recycled water waterfalls, native hammocks and deep trenches - and on the roof arrays of solar panels that will produce enough juice to run the building and give the extra watts back to the grid. The building sports frosted glass walkways, inspirational quotes of the Constitution, neon sculpture, reclaimed teak benches, Cornwall granite, its own subterranean wastewater treatment plant and a dozen gardens in the sky, one representing the flora of the American Midwest. There's also a pub, a gym, a post office and a posh Marine barracks, with millionaire views all the way to Westminster for the hard-working 19-year-old lance corporals. One assumes there is a CIA station, but that was not on the tour. The press were given a first look inside on Wednesday - the embassy will open its doors on Jan. 16, 2018 - and the early word from the British media was mostly positive. The Evening Standard called the interiors "stunning" and the Daily Mail said rather than a slick and hard-edged high rise, the embassy exterior had a "soft and pillowy" feel - because of the plastic polymer veils that drape three sides of the building, enhancing its energy efficiency. This is a far cry from earlier critiques. Ken Livingstone, the former mayor of London, said that the city expected "something a little bit more exciting." A critic at the Guardian newspaper called the pond "a moat" and reported that the two British jurors on the design jury tried to block the design because it was too boring. They may be proven wrong. The reviews are not yet in. But the embassy is - if you can say this about an American embassy in 2017 - kind of cool. The new U.S. ambassador, Robert "Woody" Johnson, a personal friend of the president and owner of the New York Jets football team, demurred when asked if Trump was planning to come early next year on a "working visit" to London and dedicate the opening. "We look forward to welcoming him," Johnson said, whenever Trump comes. "No date is set," he said. "He's a busy president." There is much speculation about a visit in February. Prominent British politicians, including the London Mayor Sadiq Khan, have pressed Prime Minister Theresa May to rescind her invitation to Trump. Activists have promised mass demonstrations if and when the American president shows up. At least one parliamentarian says that Trump ought to be arrested upon arrival. In his remarks, the U.S. ambassador stuck to the positive. He said, "Little America is moving south of the river," a new beginning in a formerly rough neighborhood of public housing and old warehouses, now exploding with growth, between the Chelsea and Vauxhall bridges. Johnson confessed he was a little wistful, too, because there is so much history at the old embassy and its location in Grosvenor Square. The first U.S. ambassador here was John Adams. The old embassy, a 1960 modernist gem by the architect Eero Saainen, was sold to the real estate division of Qatar's sovereign wealth fund, which has gobbled up high-profile London properties, including the Harrods department store. They are going to turn it into a luxury hotel. The money from its sale, and of other U.S. properties in London, funded entirely the billion-dollar embassy. The building was designed by the firm KieranTimberlake of Philadelphia. James Timberlake said that the job specs for the building were 1,000 pages long. His vision, complex and simple, was to create an embassy at once "welcoming and secure," measuring a desire to express "transparency, openness, equality" against the need to "filter all and everything and everyone who enter." Timberlake envisioned a "crystalline cube," because a cube is "efficient and provocative." He wanted "a radiant beacon," iconic architecture with interiors "light-filled, airy, with great views," that was also environmentally outstanding - the 518,000 square foot, 12-story building will produce more energy that it uses, even after it cares for 800 staff and 1,000 daily visitors. Londoners love to give nicknames to the city's cutting-edge architecture. Here the newest sky-scrappers are known to all, for better or worse, as the Gherkin, Can of Ham, Cheese Grater and the Pringle - or what the armchair critic and architectural traditionalist Prince Charles has dismissed as "absurdist picnic table."